In what situations would AJAX long/short polling be preferred over HTML5 WebSockets? I am building a small chat application for friends, but unsure about how to get information in a timely manner that is not as manual or as rudimentary as forcing a page refresh. Currently, I am implementing this using simple AJAX, but this has the disadvantage of regularly hitting the server when a short timer elapses. In researching long/short polling, I ran across HTML5 WebSockets. This seems easy to implement, but I'm not sure if there are some hidden disadvantages. For example, I think WebSockets is only supported by certain browsers. Are there other disadvantages to WebSockets that I should be aware of? Since it seems like both technologies do the same thing, in what sorts of scenarios would one prefer to use one over the other? More specifically, has HTML5 WebSockets made AJAX long/short polling obsolete, or are there compelling reasons to prefer AJAX over WebSockets? WebSockets is definitely the future. Long polling is a dirty workaround to prevent creating connections for each request like AJAX does -- but long polling was created when WebSockets didn't exist. Now due to WebSockets, long polling is going away. WebRTC allows for peer-to-peer communication. AJAX - request → response. Creates a connection to the server, sends request headers with optional data, gets a response from the server, and closes the connection. Supported in all major browsers. The main advantage of WebSockets server-side, is that it is not an HTTP request (after handshake), but a proper message based communication protocol. This enables you to achieve huge performance and architecture advantages. For example, in node.js, you can share the same memory for different socket connections, so they can each access shared variables. Therefore, you don't need to use a database as an exchange point in the middle (like with AJAX or Long Polling with a language like PHP). You can store data in RAM, or even republish between sockets straight away. People are often concerned about the security of WebSockets. The reality is that it makes little difference or even puts WebSockets as better option. First of all, with AJAX, there is a higher chance of MITM, as each request is a new TCP connection that is traversing through internet infrastructure. With WebSockets, once it's connected it is far more challenging to intercept in between, with additionally enforced frame masking when data is streamed from client to server as well as additional compression, which requires more effort to probe data. All modern protocols support both: HTTP and HTTPS (encrypted). Remember that WebSockets generally have a very different approach of logic for networking, more like real-time games had all this time, and not like http. One contending technology you've omitted is Server-Sent Events / Event Source. 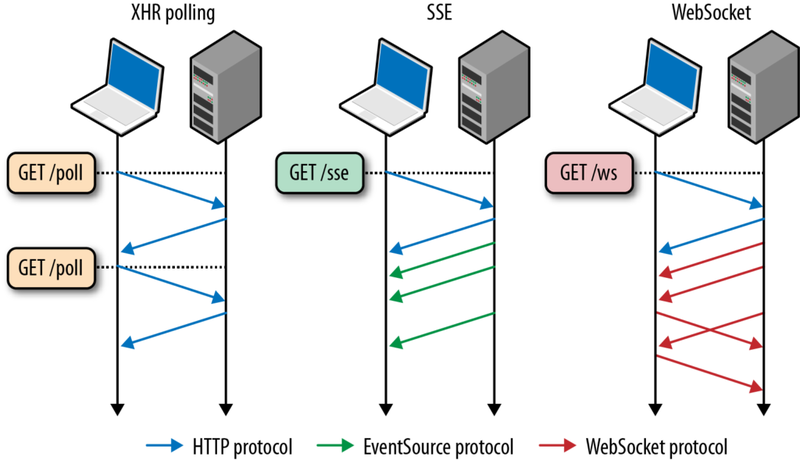 What are Long-Polling, Websockets, Server-Sent Events (SSE) and Comet? has a good discussion of all of these. Keep in mind that some of these are easier than others to integrate with on the server side. For chat applications or any other application that is in constant conversation with the server, WebSockets are the best option. However, you can only use WebSockets with a server that supports them, so that may limit your ability to use them if you cannot install the required libraries. In which case, you would need to use Long Polling to obtain similar functionality. XHR polling A Request is answered when the event occurs (could be straight away, or after a delay). Subsequent requests will need to made to receive further events. Server Sent Events Client sends request to server. Server sends new data to webpage at any time. WebSockets After the initial handshake (via HTTP protocol). Communication is done bidirectionally using the WebSocket protocol. Facebook notifications web sockets vs. pulling? WebSockets or periodical Ajax requests? What is the best way to send push notification in angular webapp from mongodb? Why use AJAX when WebSockets is available? How to optimize the ajax requests in Jquery? What browsers support HTML5 WebSocket API? Would long-polling be a good substitute for websockets in this case?